In the late 1930s the Pennsylvania Railroad decided to equip its low grade Columbia and Port Deposit Branch with a state of the art signaling system in conjunction with an equally cutting edge electrification project. The Rule 261 signaling on a single track line with passing sidings was controlled by CTC machines at just two on line towers, PERRY and COLA. 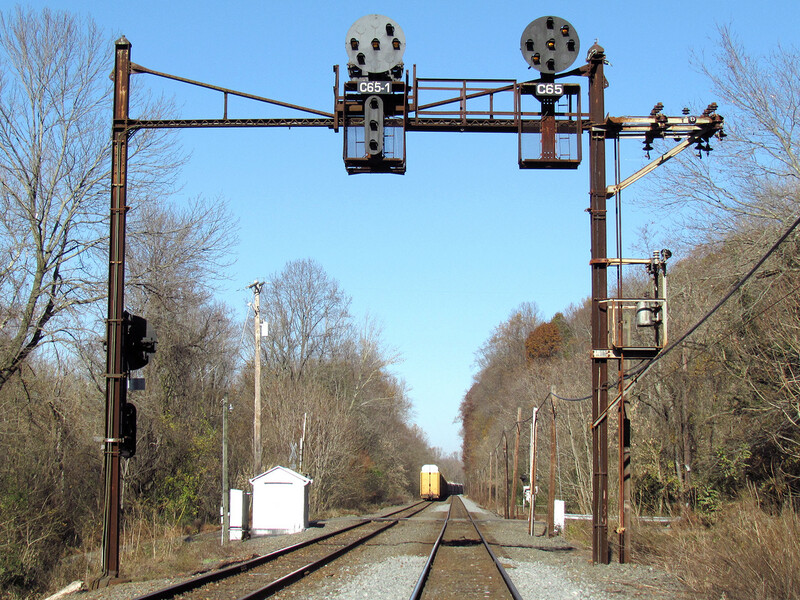 Remarkably this signaling lasted over 80 years with the northern half being retired in 2012 and the southern half being retired on April 9th, 2018. Fortunately I had been able to fully document the line as it originally appeared over the preceding decade and a half and you can review my work here. Compared with other recent NS re-signaling projects that have continued through multiple calendar years, the PRR signaling on the lower 20 miles of the Port Road were replaced in about 6 months. 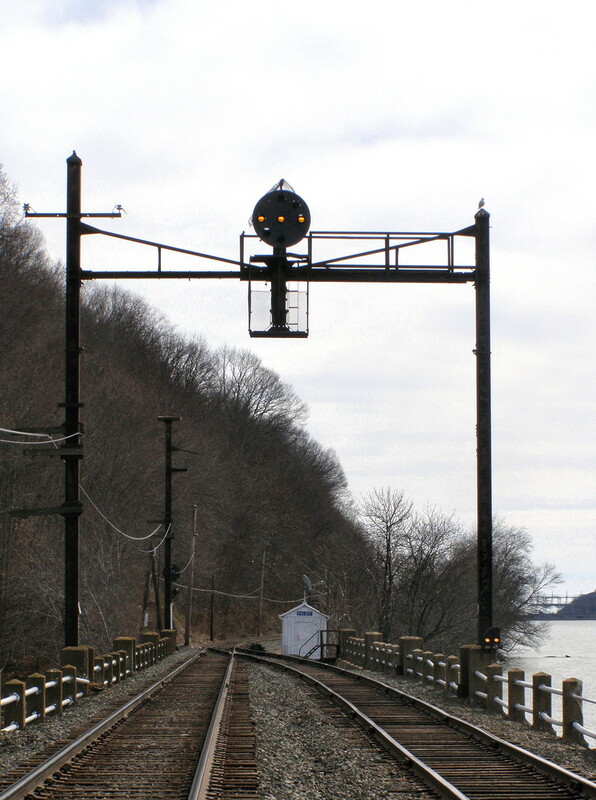 Not only were the remaining PRR position light signals replaced, but NS also decided to convert the cab signaled line to Rule 562 operation, eliminating four automatic signal locations and converting another to a controlled point. 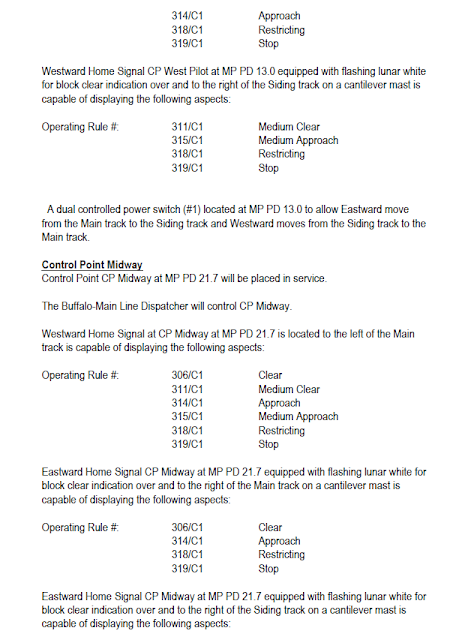 Of course I don't need to tell you all of the changes that took place between PERRY interlocking on the NEC and CP-MIDWAY because NS is nice enough to publish comprehensive change documentation that also includes all possible signal aspects. 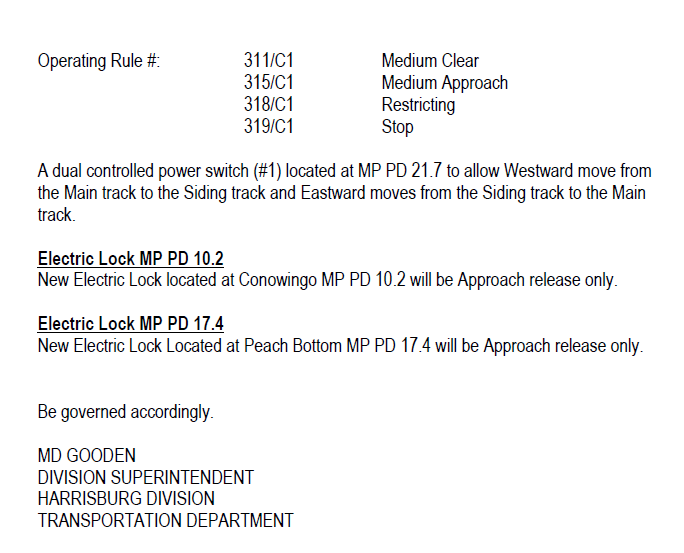 Starting from Amtrak territory at PERRY, the first major change was the conversion of the former CP-MINNICK interlocking to a new CP-MINNICK controlled point. 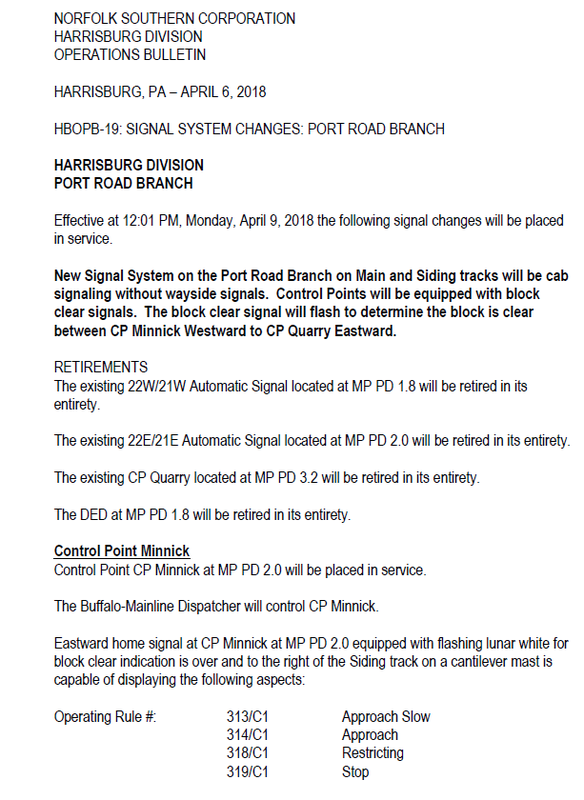 CP-MINNICK used to provide access to the west end of the Perryville freight yard and was downgraded to an automatic signaling location when the yard was removed. Well, for whatever reason NS decided to install a controlled point cantilever mast in between the two former CP-MINNICK home signals. 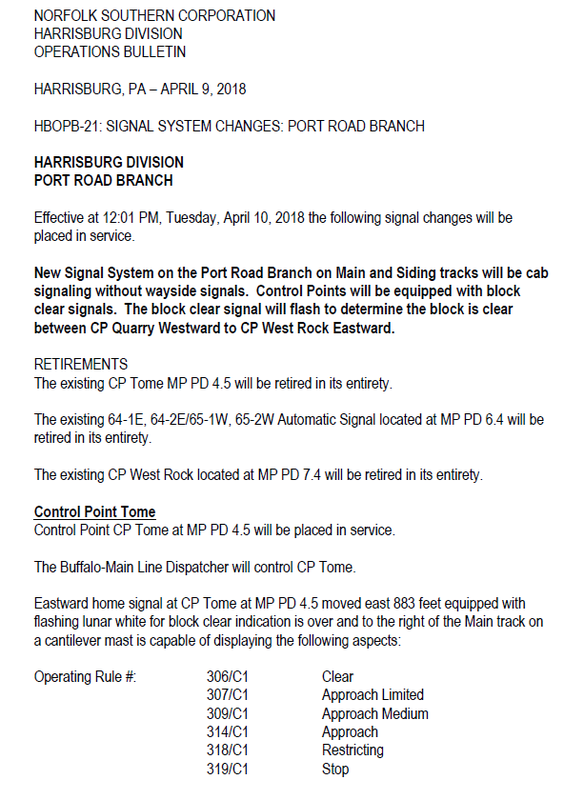 I guess it allows locomotives and trainsets to be reversed at the Perryville wye track without having to tie up the entire stretch of track south of CP-QUARRY, where NS likes to store trains waiting to get onto the NEC. 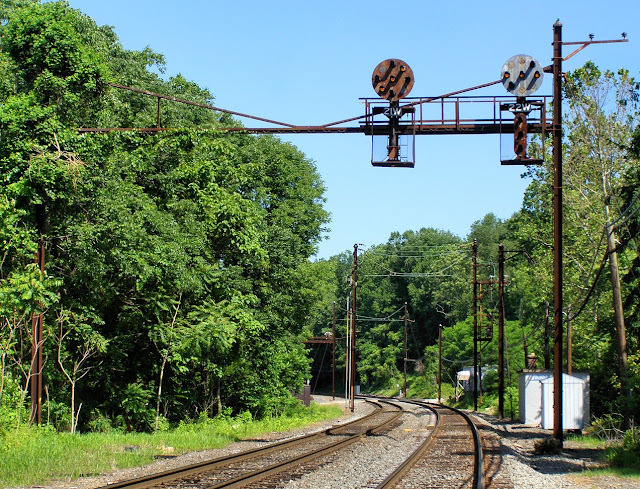 It could also be a way for the signal department to add what is functionally an automatic signal despite a possible management directive to go Rule 562. Without the signal at CP-MINNICK, crews cannot tell if they are approaching a Slow Approach or a Stop signal at PERRY from their cab signal alone. 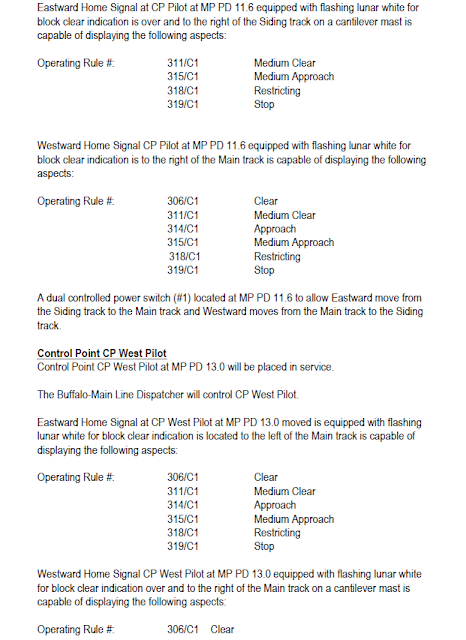 The aspect chart also shows how the distant to CP-QUARY on the siding track has to display both Approach Limited for a Limited Clear and an Approach Medium for a Medium Approach. 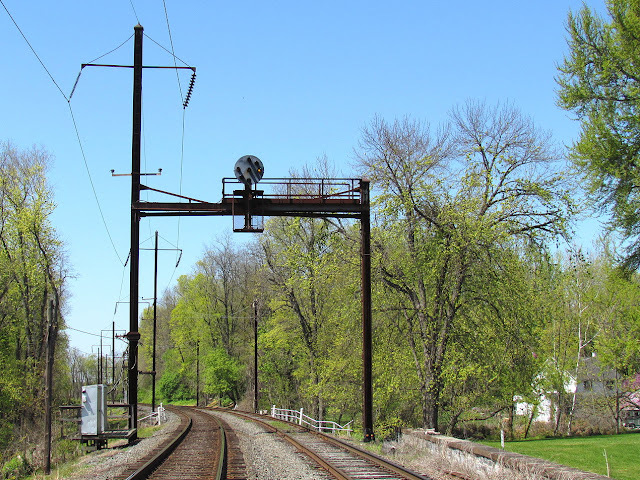 Also being wiped away are electro-mechanical cab signal code generators of the type that existed at the cab signal cut between CP-MINNICK and PERRY. Moving on, CP-QUARRY has had its eastbound home signal moved to be closer to the switch. 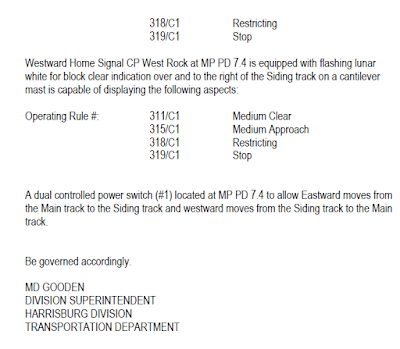 Evidently PTC and cab signals are a substitute for sight lines. Also, NS is taking a play from the Amtrak playbook and having trains diverge over Medium Clear at CP-QUARRY approaching a Medium Clear/Approach at CP-TOME and Limited Clear approaching a Clear/Approach signal at CP-TOME. 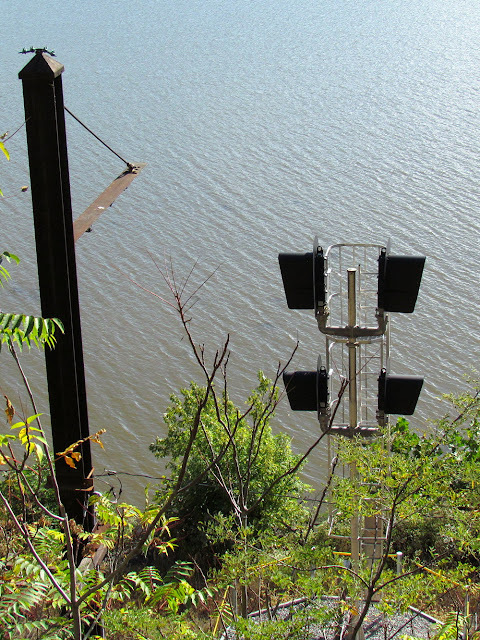 This mast has been moved around the curve. 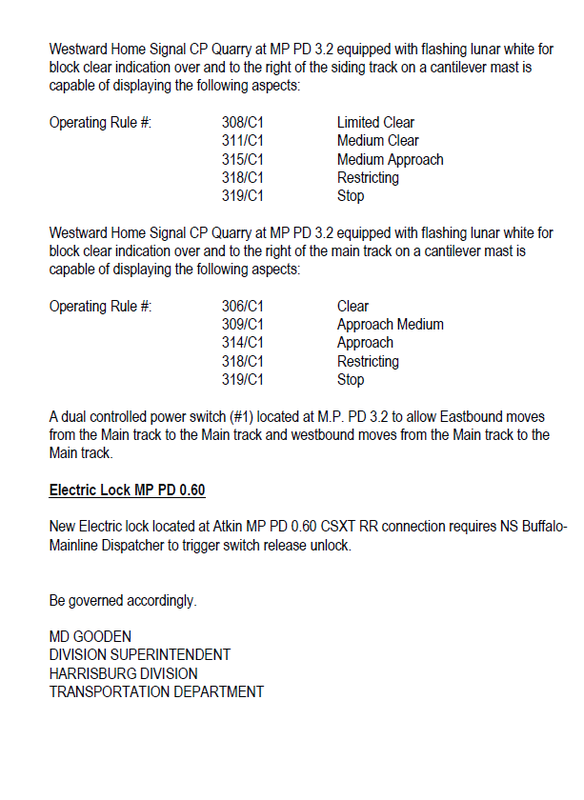 At CP-TOME we see the same thing with Approach Medium and Approach Limited that we saw at CP-MINNICK. Also, both signals have been moved 800 feet closer to the turnout to consolidate the interlocking limits. 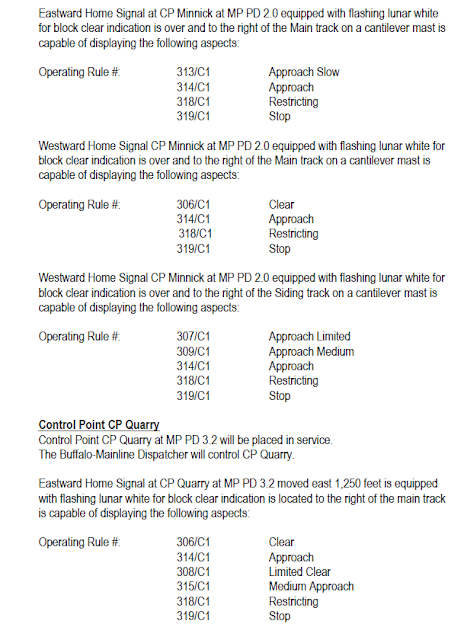 Old CP-TOME extended interlocking limits. 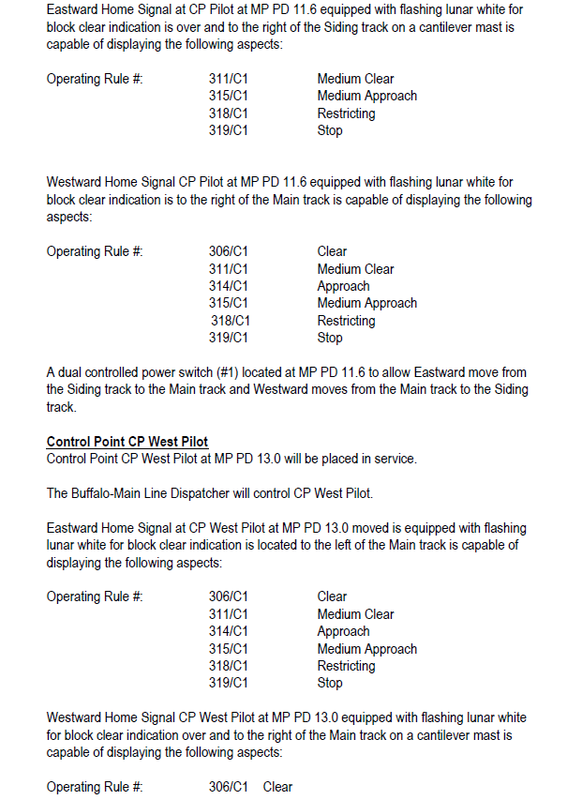 Moving on the photogenic PRR automatic signals at MP 6 have been removed along with the less accessible signals at MP 9. Between them CP-WEST ROCK got the typical treatment. A casualty of Rule 562. 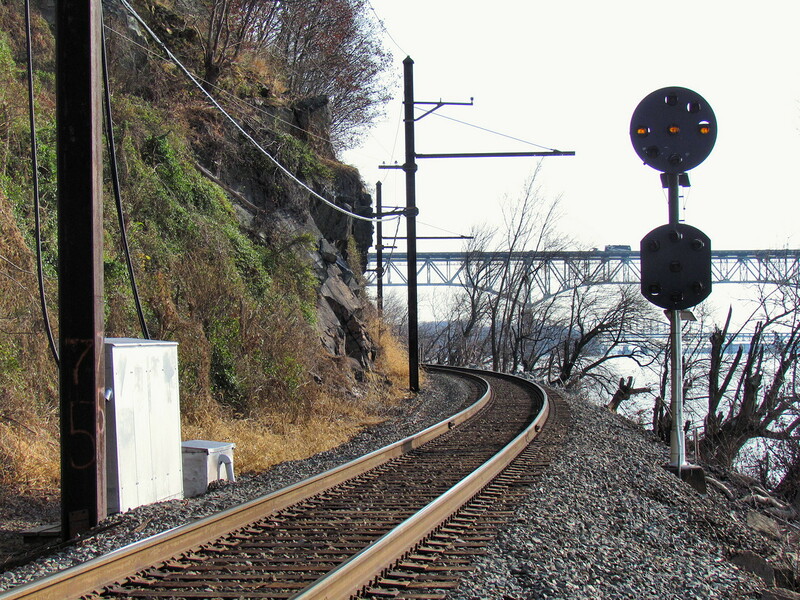 The un-signaled Pilot siding was upgraded to a signaled siding with Medium Speed turnouts in the same fashion as the Harbor siding was in 2012. Not sure if the new signals are masts or cantilevers. 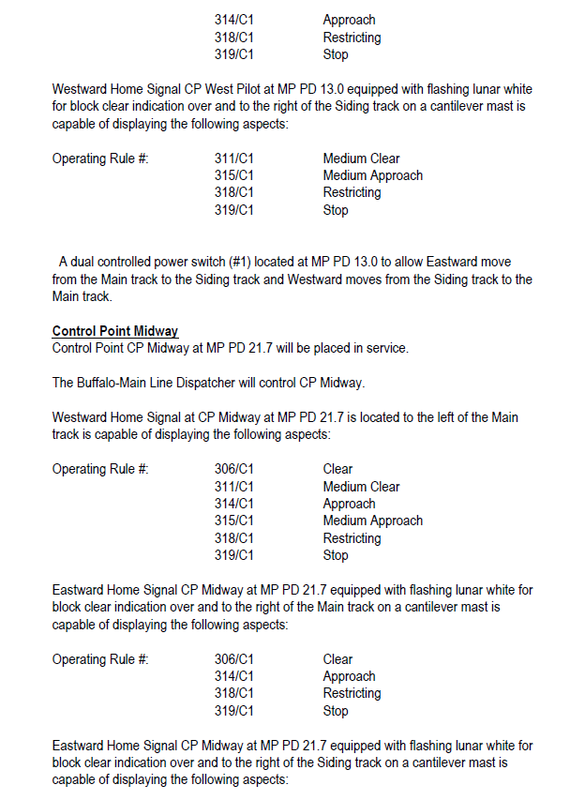 Beyond that the MP 15 and MP 18 single track automatics were both removed and CP-MIDWAY was re-signaled in the standard fashion. 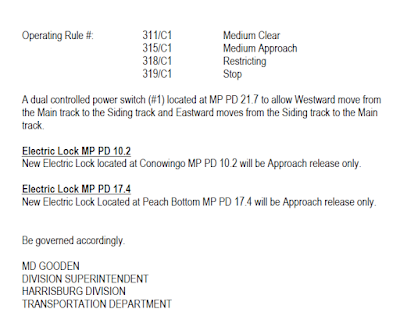 In addition to the details I mentioned above, the other interesting note was the continued survival of the Rule 261/CSS segment between CP-MIDWAY and CP-SHOCKS. 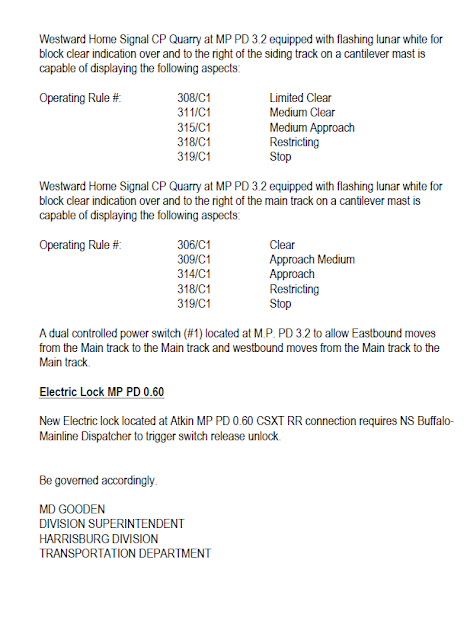 This was re-signaled in 2012 before NS decided to go for Rule 562. 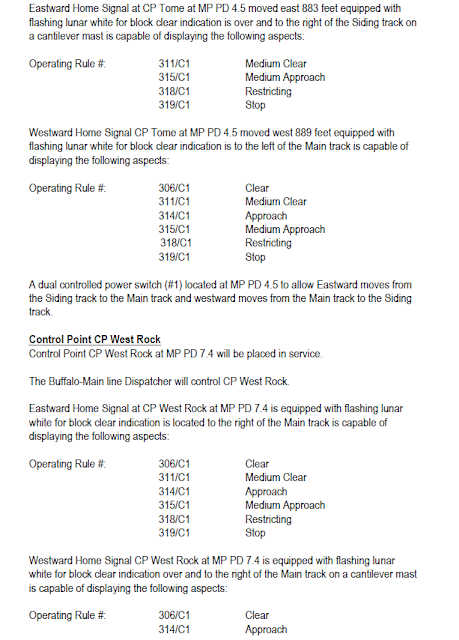 I had previously noticed 'C' boards going up at the re-located CP-WEST HARBOR, but have not heard anything about an actual 562 conversion. 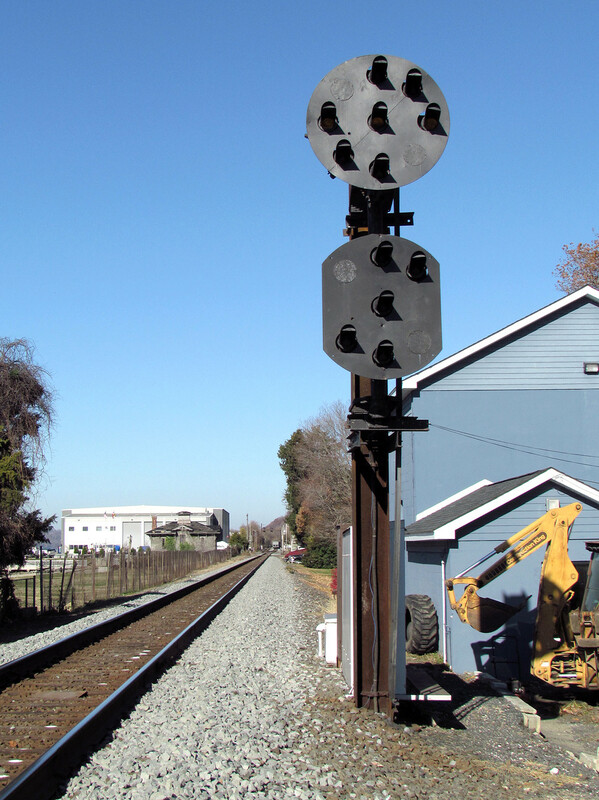 Seems a bit of a waste on what is still a pretty new signal installation. 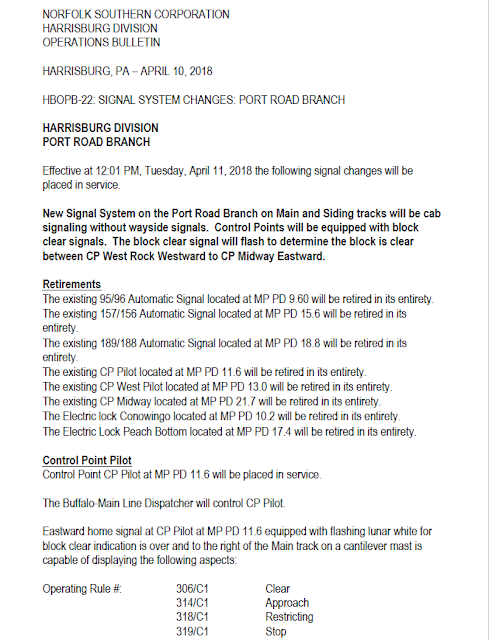 Finally, let's not forget old CP-JEB, although not covered in these builtin orders, was also re-signaled at some time in the recent past (probably when STELL to SHOCKS went 562). While this might mean the end for all amber PRR position lights on Class 1 freight railroads, I can confirm that CP-PENNROSE in Philadelphia still has a few. The winner of the winner of the 1930's PRR low grade signaling hunger games?